Mouse anti Human protein gene product 9.5 antibody, clone 13C4 (7863-2004) used for the detection of PGP9.5 immunoreactive nerve fibers in porcine gastric mucosa by immunofluorescence. Tissue sampling and cell measurements. (a) Picture presenting the interior surface of the "experimental animal" stomach, exposed by cutting along the greater curvature of the stomach. Ulcers are indicated by red arrows. (b) Microphotograph showing Haematoxylin and Eosin staining of the gastric ulcer margin. The gastric mucosa shows a defect (red ellipse with the inscription “Ulcer” and arrows) that extends into the deep muscular layers. (c) Diagram showing the method of tissue sampling. The tracer injection site is indicated by the violet arrows. The red vertical stripes symbolize the subsequent 0.5 cm thick transverse sections taken in specific intervals (section I—1.5 cm; section II—3.5cm; section III—5.5 cm; section IV—7.5cm) starting from the pyloric sphincter (section 0—blue vertical stripe). Subsequently, each of these sections (I, II, III, IV) was cut into 20 μm thick cryostat consecutive microscopic slices for future processing. The red circle symbolizes the localization of ulcer induced in experimental animals. (d, e, f) Photomicrographs showing: (d) bundles of PGP-immunoreactive fibers (arrowheads) and perikarya (arrows). Double arrow points to the perikaryon which was fast blue (FB) positive [the perimeter (l) and area (A) of the cell body are included]; (e) fast blue (FB) positive cell body (double arrow) with lines indicating its dimensions; (f) the image formed by merging both channels (green: PGP 9.5 and blue: FB). From: Zalecki M (2015) The Influence of Antral Ulcers on Intramural Gastric Nerve Projections Supplying the Pyloric Sphincter in the Pig (Sus scrofa domestica)—Neuronal Tracing Studies. Mouse anti Human protein gene product 9.5 antibody, clone 13C4 used for the detection of PGP9.5 immunoreactive nerve fibers in porcine descending colon by immunofluorescence. Distribution pattern of nervous structures immunoreactive to protein gene-product 9.5 (PGP 9.5)—used as a panneronal marker and calcitonin gene-related peptide (CGRP) in the wall of porcine descending colon under physiological conditions (a), and after T2-toxin (b) and zearalenone (c) administration; I—myenteric plexus; II—outer submucous plexus; III—inner submucous plexus. CGRP-positive neurons (I,II,III) are indicated by arrows. Images I, II, and III are composites of merged images taken separately from green (PGP 9.5) and red (CGRP) fluorescent channels. 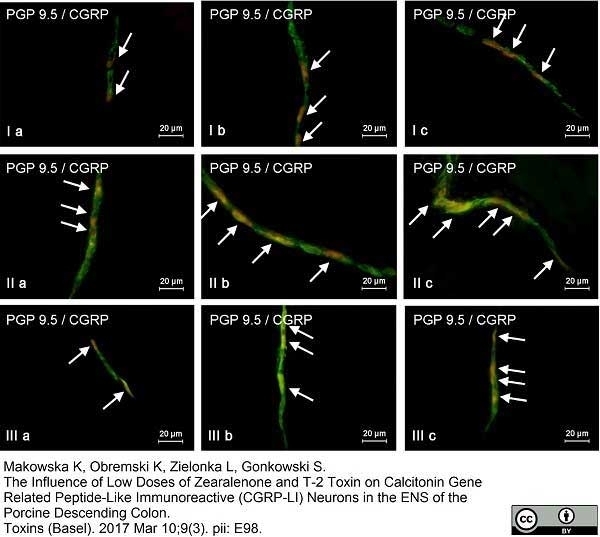 From: Makowska K, Obremski K, Zielonka L, Gonkowski S.
The Influence of Low Doses of Zearalenone and T-2 Toxin on Calcitonin Gene Related Peptide-Like Immunoreactive (CGRP-LI) Neurons in the ENS of the Porcine Descending Colon. Toxins (Basel). 2017 Mar 10;9(3). pii: E98. Mouse anti Human protein gene product 9.5 antibody, clone 13C4 recognizes protein gene product 9.5 (PGP9.5), a ubiquitin hydrolase which is widely expressed in neuronal tissues and represents 1-2% of total soluble brain proteins. PGP9.5, also known as ubiquitin C-terminal hydrolase 1 (UCHL-1), is involved in the regulation of the ubuiquitin pathway. This product stains neuronal cell bodies and axons in the CNS and periphery, small nerve fibres in peripheral tissues, neuroendocrine cells in the pituitary, thyroid, pancreas and tumours of the DNES. Also stains neuroendocrine cells in human adult gut (unlike 31A3). Clones 31A3 and 13C4 each recognise a different epitope towards the N-terminus of the protein. 1 Antigen is stable in formalin fixed paraffin embedded sections, however we recommend fixation in 95% ethanol/5% acetic acid for 2-3 hours prior to paraffin embedding. Can be used without acid/ethanol fixation if the sections are subjected to microwave treatment in citrate buffer by standard methods. Wilson, P.O. et al. 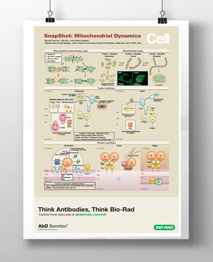 (1988) The immunolocalization of protein gene product 9.5 using rabbit polyclonal and mouse monoclonal antibodies. Br. J. Exp. Pathol. 69: 91-104. Kotani, T. et al. (2010) Expression of PTPRO in the interneurons of adult mouse olfactory bulb. J Comp Neurol. 518: 119-36. Buels, K.S. et al. (2012) Non-bronchodilating mechanisms of tiotropium prevent airway hyperreactivity in a guinea-pig model of allergic asthma. Br J Pharmacol. 165: 1501-14. Sasaki, H. et al. 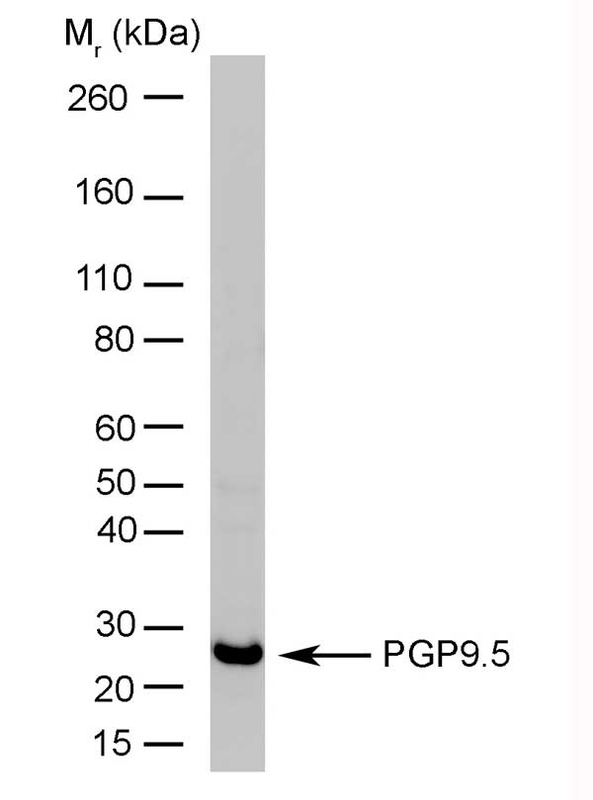 (2001) Expression of the protein gene product 9.5, PGP9.5, is correlated with T-status in non-small cell lung cancer. Jpn J Clin Oncol. 31: 532-5. Burli&nacute;ski, P.J. (2012) Inflammation- and axotomy-induced changes in cocaine- and amphetamine-regulated transcript peptide-like immunoreactive (CART-LI) nervous structures in the porcine descending colon. Pol J Vet Sci. 15 (3): 517-24. Bulc, M. et al. (2012) Immunohistochemical characterization of the porcine nodose ganglion. Dudek, A. et al. (2012) Immunohistochemical characterization of neurons in the vestibular ganglion (Scarpa's ganglion) of the pig. Pol J Vet Sci.15: 499-507. 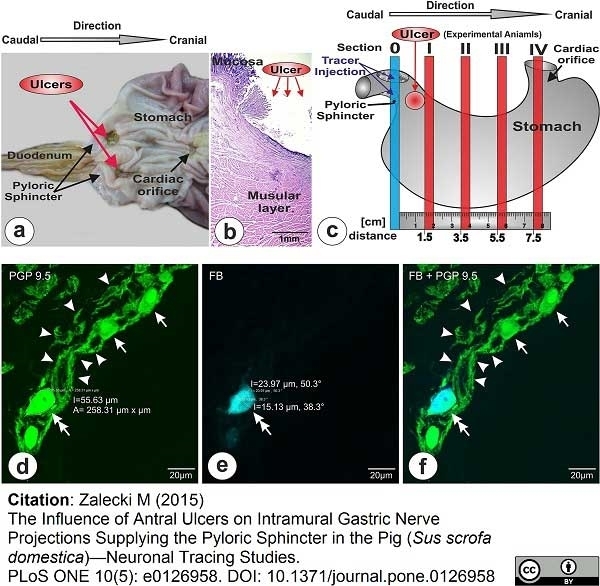 Zalecki, M. (2015) The Influence of Antral Ulcers on Intramural Gastric Nerve Projections Supplying the Pyloric Sphincter in the Pig (Sus scrofa domestica)-Neuronal Tracing Studies. PLoS One. 10 (5): e0126958. Cooke, H.J. et al. (1999) Activation of neuronal adenosine A1 receptors suppresses secretory reflexes in the guinea pig colon. Am J Physiol. 276 (2 Pt 1): G451-62. Godlewski J & Pidsudko Z (2012) Characteristic of galaninergic components of the enteric nervous system in the cancer invasion of human large intestine. Ann Anat. 194 (4): 368-72. Kaleczyc, J. et al. (2007) The distribution and chemical coding of intramural neurons supplying the porcine stomach - the study on normal pigs and on animals suffering from swine dysentery. Anat Histol Embryol. 36 (3): 186-93. Komori, N. et al. (2003) Presence of beta-arrestin-1 immunoreactivity in the cutaneous nerve fibers of rat glabrous skin. Brain Res. 988 (1-2): 121-9. Pidsudko, Z. et al. (2008) Distribution and chemical coding of intramural neurons in the porcine ileum during proliferative enteropathy. J Comp Pathol. 138 (1): 23-31. Pidsudko, Z. (2013) Immunohistochemical characteristics and distribution of neurons in the intramural ganglia supplying the urinary bladder in the male pig. Pol J Vet Sci. 16 (4): 629-38. Sienkiewicz, W. et al. (2000) Has active immunization against gonadotrophin-releasing hormone any effect on testis innervation in the pig? An immunohistochemical study. Anat Histol Embryol. 29 (4): 247-54.